We've seen a number of camera samples with prototype Sony Xperia Z handsets already, but what we were waiting for is comparison with other flagship smartphones to gauge performance against the competition, and that wasn't too far off, as you can see int he slideshow below. 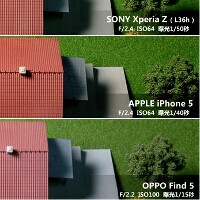 Image comparisons have emerged of the Z with an iPhone 5 unit, and the Oppo Find 5, which has very similar specs with Sony's newest flagship handset, down to the 13 MP Exmor RS camera sensor. Noise is kept in check with the Xperia Z processing algorithms, for the sake of some detail in comparison with the other two, and when it comes to the night shot, Sony's sensor gets it a bit better than the iPhone 5 and the Oppo Find 5, as it pushed the ISO higher. This is most likely not a final retail version yet, either, so there might be some last minute camera software tweaks to the Xperia Z. There are also two shots which compare the display of the Z against the almost perfectly calibrated screen of the iPhone 5, and, needless to say, the Reality Display looks saturated in comparison with the iPhone, as it boosts contrasts and color in pictures and video mode. Are you serious? Only on one night shot the Xperia does a better job than the Iphone. The IP5 is the clear winner! And no, I'm not a Apple fan boy, but a Nexus4 owner. some blind and biased iFanboy is saying that the iSh*t 5 is the clear winner. iFanboy? Dude, I've never had an Iphone. I'm a Nexus user as said in my last post. If someone is biased then it's you mate, don't be so childish. You don't have to like the Iphone, but credits there where credits belong and the Iphone was always one of the best in imaging and the IP5 is no exception. You're right, it WAS! Not anymore! iP5 has better optics so its pics have more details, while HDR of Z excels giving its pics more contrast and brightness. b-c we don't see the full pictures so it's hard to judge, but I think Z will have better zooming capability with more pixels. Overall it's close but to me it's nicer to look at Z pictures unless you need very small details. I don't know where you see this mate... We all have to agree that the iPhone has a fantastic camera but the Z seems from these samples to have a tiny bit more... fantastic camera. Which is already a great success. And if to this we add some very promising video takes that I have seen, then it's clear that the HDR function really makes a diference. Everything else is a bit nit picking for me, the truth is that the Z is shaping up to be an excellent all rounder. +1 to this. PA was always biased towards iPhone and Apple in general. A couple of 100% crops http://mobile.it168.com/pic/2013011702450435183_jpg.shtmlhttp://mobile.it168.com/pic/2013011702450672277_jpg.shtmlhttp://mobile.it168.com/pic/2013011702440907852_jpg.shtmlhttp://mobile.it168.com/pic/2013011702433499623_jpg.shtmlhttp://mobile.it168.com/pic/2013011702433257849_jpg.shtmlhttp://mobile.it168.com/pic/2013011703065051229_jpg.shtmlhttp://mobile.it168.com/pic/2013011702443870822_jpg.shtml 2 interesting things: Sony and Oppo use the same sensor but a different lens, and the SW seems different because there are major differences in ISO & shutter speed values, Sony usually shooting at higher ISO with lower shutter time. Oppo, as I've pointed out before, seem to use less noise reduction and deliver sharper images, take a close look at details on the 1st picture I posted and the lines in the last. Still look forward to full size comparison. the color of the xperia z is fantastic bit saturated but perfect for me but i guess the iphone 5 has better detail i think in night shots in 6th, 7th pic and indoor just like the buttons in the 14th pic the macro shots are breath taking but lets not forget that this samples are from prototype and im quite optimistic that it will be tweaked in the final release unit! kudos sony!! Those images are 100% crops. If viewed on a standard way those images are already fantastic. For basic use of the camera I believe the Xperia Z would be stellar, for serious photography we need DSLR for that part. . .
yep i know im just saying it for the sake of comparison nothing else. 100% crop for the 7th pic but not in the 6th and 14th pic but i guess what matters to me is the overall balance of the device. im looking forward that it`ll be tweak before releasing it. Sony gets its s**t right in cameras! Go, Xperia Z! On the same note, doesn't the iPhone 5 too use Sony's sensor? Not so fast. It's only January. The last samples in low light iP5 is better with less noise Against the rising sun Z is clearly better. in other samples Z is slightly better than iP5. Overall Z wins but Sony must improve low light capability of Z camera to make it the absolute best phone camera. @Scarambay I think so too, yes they do! there's a reply button for a reason.